There is plenty that is openly wrong with this beleaguered aspiring epic. It’s rhythm of storytelling feels all wrong. One minute we are looking at Kangana Ranaut playing herself—wide-eyed tightlipped defiant stubborn and sinister—the next minute she forgets herself and immerses herself in her character. Much like the Queen-warrior herself who never could decide whether she wanted to be a wife, mother, warrior or rebel and ended up being an amalgamation of all these roles. The battle scenes that take up plenty of the lengthy narrative are heavily influenced by Bhansali’s Bajirao Mastani. But Ranaut manages the horse-riding and sword-fencing with impressive self-assuredness. I wouldn’t agree with Mr Manoj Kumar when he says Kangana was born to play Rani Laxmibai. But she certainly gives the complex character a kind of cutting edge that makes the Rani empowered and powerful. The supporting cast is largely wasted. Barring Jishu Sengupta as the Rani’s husband who is shown to be somewhat delicate. Is he meant to be gay? More than the politics of invasion and acquisition I like the petticoat politics of the film, the friendship between Rani Laxmibai and the uncommonly valorous commoner Jhalkaribai (Played with spirited affection by Ankita Lokhande) which culminates in the two ladies battling the common enemy in the climactic battle. In fact, the way all the women of Jhansi come out of their kitchens to battle it out on the preying field, is one of the great charms of this flawed but fabulous fable of feminine fierceness, as are Prasoon Joshi’s dialogues which suggest a kind of deeprooted empathy between history and girl power. 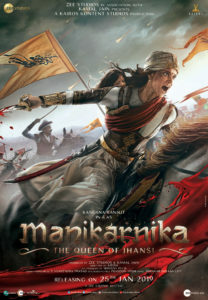 Manikarnika could have easily avoided these violent bouts, concentrated more on creating a drama of disambiguation that destroyed the Indian kingdoms during the British Raj. I am sure there was more to Rani Laxmibai than the expensive saree and jewelery, the mystery and the dancing eyes. But what we see is what we get in this film. And that is quite a lot. All said and done, Manikarnika moves us, though not in ways they should have. There is too much going on at any given time to focus on the heart and thoughts of a woman who defeated the Britishers with a child in her lap. Did the child ever wet the Rani’s costly silk sarees? We would never know. The characters of this film are not prone to human frailties. 15 queries in 0.604 seconds.